Orange Peel quilt blocks have gentle curves with perfect cutting and stitching lines. These designs are fun! Orange Peel is an amazingly versatile pattern and Inklingo makes it possible to make lovely variations more easily than ever before. See why quilters love Inklingo Orange Peel. The extra shapes for Alabama Beauty, Improved 9-Patch, and Eiffel Tower are in the Deluxe shape collection. Alabama Beauty, Improved 9 Patch, Eiffel Tower, and Orange Blossom (above) are uncommon designs because there has never been a good way to make them by machine. With Inklingo, you can print the shapes and piece the quilts by machine, by hand, or by a combination of hand and machine (hybrid). Sewing curves with Inklingo is more fun because everything fits perfectly, presses well, and lies flat. Sew by machine or by hand or a combination of both. 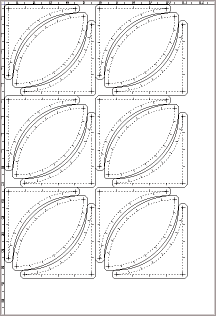 The Combo layouts save time and fabric when two shapes are to be cut from the same fabric. All of the shapes are provided separately too, of course.